Fox News’ senior White House correspondent: Ed Henry: walked out of Friday’sWhite House press briefing: when, for the first time, he was ignored by the press secretary. The relationship between Henry and White House Press Secretary: Jay Carneyis seldom cordial and often rancorous. Rather than answer the Fox News reporter’s question, Carney often accuses Henry of parroting Republican talking points. After Carney called on every TV reporter at Friday’s briefing with the exception of Henry, he began asking his question. Henry couldn’t be missed. He sat on the far right (from Carney’s view) of the front row. 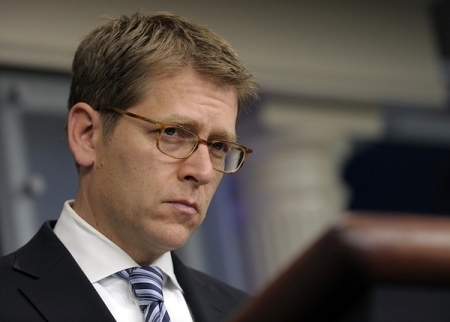 He only managed to get out “Jay…” before Carney called on The Chicago Tribune’s Christi Parsons. As she asks her question, Henry can be seen saying something to the reporter next to him and then shaking his head. He gives is one more go. When the Fox reporter is once again ignored, he smiles , gets up and leaves the briefing room. The purpose of a free and independent press is to challenge the government, not act as its cheerleader. The current administration doesn’t seem to have learned that.